Today is my anniversary of baptism; I am twenty-five years old. It's my Silver Jubilee! When I think of the adventure that began that day at Our Lady of Perpetual Help in little Quaker Hill, Connecticut, I cannot but confess that one of the most abiding graces has been the 'cloud of witnesses' that has guided and supported me along the way. So today in my gratefulness I pray in special way for everyone the Lord has given me to accompany me in this journey. Friar 1: That's very interesting. 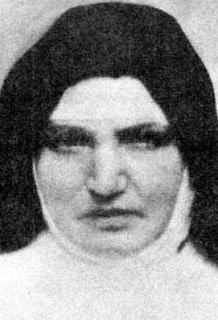 Being the mother of a friar makes you become a daughter of Padre Pio. Friar 1: Well Padre Pio already left the Order. Friar 1: Well in the friar database [which is kept here in the General Curia] one of the fields is 'way of leaving.' [modo di uscita] And one of the choices [for filling the field] is death. Today in Rome it's the feast of St. Teresa Benedicta of the Cross (Edith Stein), a feast day because she is one of the many patron saints of Europe, except where I happen to be offering Mass this week, at the Capuchin Sisters of Mother Rubatto, where today is the feast of their foundress, Blessed Maria Francesca (Anna Maria) Rubatto (1844-1904). Their General Curia is on the other side of the Villa Borghese from where we are and the priests here who sign up take weekly turns offering the weekday Mass there. I've appreciated getting to know them; they seem like a great community. It's too bad we don't have them in the U.S.A. So I could prepare for the Mass today, the sisters lent me a copy of the liturgy for the day. Since not much was going on in the office--August in Rome you know--I made a translation of the reading offered for the Office of Readings. Today is a big Franciscan feast, that of Our Lady of the Angels of the Portiuncula, when, also for all the faithful, according to a certain tradition by the request of St. Francis himself, the Pardon of Assisi or Portiuncula indulgence is available at your local Franciscan church or oratory, or at your parish church, visited to honor Our Lady and the Angels, and according to the normal conditions for the gaining of indulgences, of course. 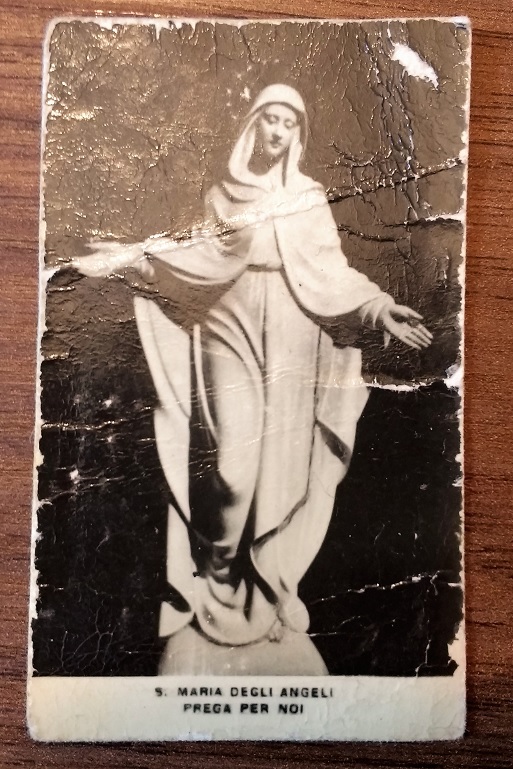 Today I'm thinking of the little holy card of Our Lady of the Angels, which I've had with me since, as best as I can reconstruct the timing, since the morning of Friday, April 23, 1993. Comments on this blog are moderated. When you leave a comment, I receive a notification and choose whether or not to publish it. I have never had much trouble with having to reject comments and I publish almost all that are submitted. Sometimes when I reject a comment I myself leave a comment in its place to explain my decision.